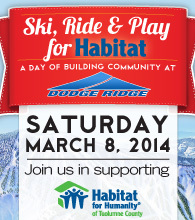 March 3, 2014 — PINECREST, Calif. – This upcoming Saturday, March 8, Dodge Ridge proudly hosts the annual Ski, Ride & Play for Habitat and the Taste for Tuolumne with all proceeds benefiting Habitat for Humanity of Tuolumne County. This exciting day is filled with a Vertical Feet Challenge Ski-a-Thon (for all ages and abilities), Live Music featuring local favorite Uplands Drive, and a sampling of the region’s best food, wine & Beer at the Taste of Tuolumne! Habitat For Humanity of Tuolumne County (HFHTC) is an affiliate of Habitat for Humanity International and is a nonprofit, ecumenical Christian ministry founded on the conviction that every man, woman and child should have a decent, safe and affordable place to live in dignity and safety. The Ski, Ride & Play for Habitat and Taste of Tuolumne is an annual event at Dodge Ridge created as a way to give to the community by hosting an action-packed day of fun and exciting events with all proceeds benefiting HFHTC. Events kick off on Saturday, March 8 at 10 a.m. with the start of the Vertical Feet Ski-A-Thon Challenge. Participants can compete individually or as part of a team with each lift ride earning points towards determining an overall Challenge winner. Extra points can be picked up by completing additional challenges during the event and by wearing a silly hat or costume throughout the Vertical Feet Challenge. Pre-registration is recommended though sign-ups will be available the day of the Challenge. Dodge Ridge season pass holders may compete with a donation of any amount to HFHTC and for other competitors lift tickets are only $10, with a $100 donation to Habitat for Humanity. Visit the Events & Activities page to download a pledge form and begin securing your sponsorships now! The Taste of Tuolumne is open to the public on Saturday afternoon from 3 to 5 p.m. and includes unlimited food samples from: Black Oak Casino, The Candy Vault, Christopher’s Ristorante Italiano, McCaffrey House, Pizza Factory, The Rock of Twain Harte, Diestel Turkey, China House, Twain Harte Market and more with beer and wine tastings provided by Miller/Coors, Barefoot Wines, Gallo Wines, Gianelli Vineyardsand Indigeny! In addition, the Taste of Tuolumne features live music from Sonora-based Uplands Drive performing a mix of classic, modern and alternative rock along with today’s favorites. Taste of Tuolumne tickets are available in person at Dodge Ridge for just $20 with kids 12 & under free. For more information on this weekend’s Ski, Ride & Play for Habitat Challenge and the Taste for Tuolumne please call Dodge Ridge at (209) 965-3474 or visit the Events & Activities page. Located in Tuolumne County off highway 108, Dodge Ridge is by far the closest skiing and riding to Bay Area & Central Valley locations. The resort offers 1,600 vertical feet, 67 runs, 12 lifts and 852 acres of skiable terrain. For reservations and additional information please visit DodgeRidge.com or call (209) 965-3474.